In the blink of an eye, flames reduce a couple’s restaurant to ash, and with it their future. Struggling with depression, dejection and suffering at lower jobs at subpar restaurants, a drunken affair sparks a scheme that sees them become grifters to earn the money needed to buy a nice restaurant. Nothing is that simple, and their fall from grace exposes their dark sides. Dreams for Sale is a tale of struggling to survive and doing bad while excusing it as a greater good. Director and writer Miwa Nishikawa doesn’t just tell a normal con artist tale, the story of Kanya and Satoko Ichizawa (Sadao Abe and Takako Matsu) is only one side of the coin. The focus in Dreams for Sale is not only on the couple, but on the female victims as well. The movie is their tales just as much as the two leads. Nishikawa wanted to write a film that dealt with issues of women, their life choices and their feelings of anxiety over whether they made the right decisions with their lives. With the various women who are targets, Nishikawa explores the social consequences of their lives, from discarded mistresses to empty beds to vengeful exes to single mothers struggling to hold things together to driven athletes on the cusp of giving up. This focus is defined in the opening and closing montages that are tiny scenes into the lives of women (some random, some central to the storyline). The two become adept at performing marriage scams on various women, getting them to loan out large sums of money after which Kanya and Satoko disappear. Satoko is not just and unwilling partner, she actively recruits new victims for Kanya. While Kanya is encouraged to form relationships with the women in order to take their money, Satoko gets a satisfaction of revenge in targeting women who ended up successful, either on their own or through successful men. It’s compensation for her own man’s failure, for what fate has given them. An underlying theme is survival, as the Ichizawas do what they need to get through their lives, to recover from disasters. The original draft was written before the earthquake in Japan, but Miwa Nishikawa revised the script after the devastation and the stories of survival, even altering the ending to something more ambiguous but still filled with the spirit of overcoming odds and still fighting. As the film started, the couple has great chemistry together, know each others thoughts and feelings and where they will end up at the end of the day. There are several scenes that are just the two having a joyful time riding together on their bike. Despite the disaster, they still have their cute couple moments. Their work in targeting victims is like a well-oiled machine. My favorite part is when Kanya is telling one of the women a heartfelt apology as to his failures and why he doesn’t want her money, all of which is being written on cue cards by Satoko as he talks. As the story progresses, cracks develop in the relationship, not because of the romance angle, but because Kanya is becoming a surrogate member of a family while Satoko spends her time alone growing more bitter. Eventually, the connection they had, of knowing what the other was thinking and being on the same frequency, becomes knocked askew. Their failure to recognize the signs causes bigger problems and leads to their downfall. The mixing of the focus between the Ichizawas and their targets of marriage fraud produced an interesting dichotomy that reached a whole host of issues, from women’s often conflicting choices in life to the societal pressures facing everyone. Each character has their own goals and desires, making the connections formed in the pursuit of fraud all the more painful when the inevitable betrayal happens. Dreams for Sale‘s multifaceted approach works towards it advantage, keeping all characters well-rounded and not devolved into black and white stereotypes. The realism keeps you hooked and makes the story all that more memorable. The length and slower pace of the film might throw off some viewers looking for a quick release, but if you stay for the journey, you will be entertained. Oddly enough, this isn’t the first Japanese film dealing with marriage fraud I’ve seen, Seduce and Swindle also featured the subject, and in a brief scene, Kanya is at a pachinko parlor with the same aquatic-themed pachinko machines that are seen in Pachinko Queen Explosion. 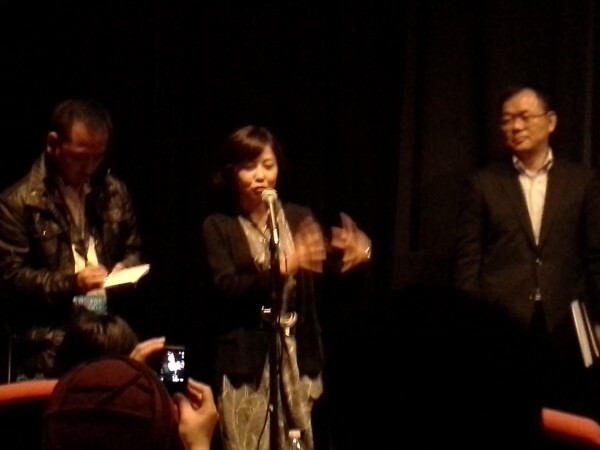 At the screening I attended at the Japan Film Festival of San Francisco, Miwa Nishikawa was there herself to answer questions. She gave some good insight into the characters she developed and the evolution of her story. 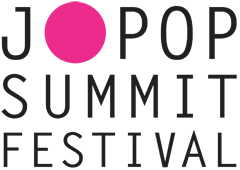 As female directors are scarce, and female directors who can do a film that deals with the issues women face beyond just love stories are even rarer (though this is Nishikawa’s 4th film, it is the first where she was able to cover that topic), I feel honored to have been a part of this screening. Director Miwa Nishikawa talks about Dreams for Sale while I fail to use a flash in a dark room.